Young couple Mac (Seth Rogen) and Kelly (Rose Byrne) have finally made the leap into full-blown adulthood. They’ve got the baby, they’ve got the dream house, now all they need are the dream neighbours to go with it. Of course this being a comedy (and one called Bad Neighbours to boot) that’s exactly what they don’t get. What they have instead is a frat house presided over by Teddy (Zac Efron) and buddy Pete (Dave Franco), with Teddy committed to throwing a party big enough to get onto the fraternity’s hallowed wall of fame. Bad Neighbours doesn’t fail to deliver on this premise, satisfyingly ramping up the comedy stakes with each exchange between the neighbours. Bad Neighbours deftly takes the audience from initial cringe inducing social awkwardness, through gross out comedy, and on to outright physical violence and destruction of property. The film is an enjoyable romp, with good chemistry between the conflicting pairs. Franco and Efron in particular make a surprisingly complementary double act, and actually manage to bring some emotional depth to what would otherwise be a couple of cardboard cut-out douchebros. The real triumph of the film is that Kelly is as much a part of the confrontation and crazy scheming as either Mac or Teddy. Free from the constraints of the nagging-wife-shackled-to-unrepentant-manboy role all too common in comedy, Byrne puts in a comedic turn equally as good as her altogether different performance in Bridesmaids. Not only does this distinction lead to more satisfying comedy, but it also helps explain why Kelly and Mac would ever have got together in the first place. The film still has problems with representation. Teddy’s girlfriend Brooke (Halton Sage) has little active impact on the shenanigans, and her sorority sisters have no part to play beyond cooing at Kelly’s stories of her own college days. Perhaps more troublesome is that nearly all the body comedy stems from the “strangeness” of the female body. Nevertheless, Kelly is hopefully a small step in the right direction. Bad Neighbours isn’t perfect. Mac and Kelly’s baby seems to function as little more than a MacGuffin, giving the couple a plausible reason to ask the frat boys to “keep it down” without seeming fogeyish. The film is also highly episodic in nature, with little logic to the story progression outside the escalation of revenge. This isn’t a problem per se, although it does suggest the premise would be better suited to a sitcom format. It also means that a final exchange between Teddy and Mac doesn’t really feel earned, and only works thanks to the inherent likeability and seeming good nature of Efron and Rogen. 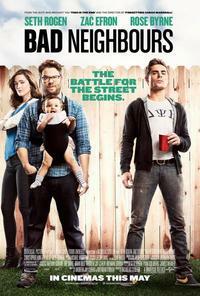 For all these niggling problems, there is much to be enjoyed in Bad Neighbours. The film finds comedy in that uneasy gap between being a teen and feeling like a “proper” adult. This isn’t exactly new ground for comedy (cf. the careers of Owen Wilson or Jason Segel), but Bad Neighbours delivers the accustomed laughs while avoiding (some) of the common pitfalls. This review was published on May 19, 2014.